IMPRESSIVE! 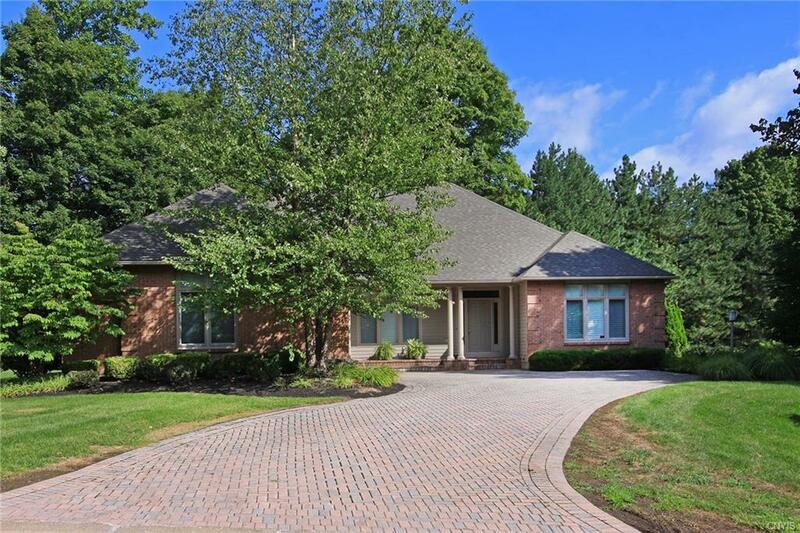 Gorgeous 1/2 acre wooded lot and a winding paved driveway lead you to this custom one level home in sought after Woodridge Farms. This stunning home boasts amenities galore. Open floor plan, vaulted ceilings, custom window shutters, gorgeous hardwoods and freshly painted interior. The gourmet kitchen with an abundance of cabinets, center island, granite counter tops, stainless appliances and gas cook-top. Enjoy dining in the spacious open eating area. Dramatic greatroom features raised hearth marble gas fireplace & marble shelving. Spacious master bedroom with walk-in closet and adjoining full bath, plus two additional bedrooms and full bath. Powder room & handy laundry center w/ built-in cabinets. Over-sized garage. Perfect location to schools, shopping, hospitals & downtown. Jamesville Dewitt High School High School / Public 8 0.32 mi. Holy Cross Elementary School * Pre-School, Elementary School / Private N/A 1.79 mi. Manlius Pebble Hill School * Pre-School, Elementary School, Middle School, High School / Private N/A 1.28 mi. Moses Dewitt Elementary School * Elementary School / Public 5 1.51 mi. Mott Road Elementary School * Elementary School / Public 6 1.25 mi. The New School * Elementary School, Middle School / Private N/A 1.31 mi. 6803 Holliston Circle, Dewitt, NY 13066 is a 3 bedroom, 2.5 bath single family home was sold for $375,000 by R. Matthew Ragan JD LLM in the Fayetteville real estate office.